This paper describes the design and operation of a new instrument for the measurement of diffusion coefficients in liquid mixtures. The instrument employs the principle of Taylor dispersion and has been designed so that it operates as nearly as possible in accordance with the simplest possible mathematical description of the measurement process. The remaining departures from the simple description are accommodated by means of small corrections which have been evaluated from a detailed theory of a practical instrument so that accurate measurement of diffusion coefficients may be performed. The apparatus has been employed to make a series of measurements of the mutual diffusion coefficient of binary mixtures among the normal alkanes hexane, heptane, and octane. The measurements have been performed at atmospheric pressure in the temperature range 290–340 K and over the entire range of mixture composition. It is estimated that the experimental data have an associated uncertainty of ±1%. 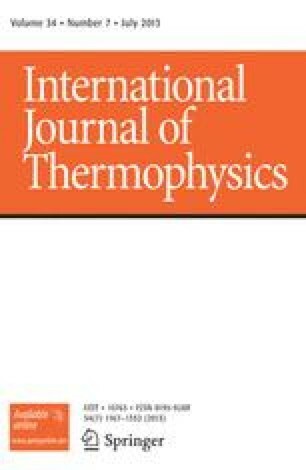 The temperature and composition dependences of the mutual diffusion coefficient have been found to be linear, and the entire body of experimental data is represented by a simple correlating equation within its estimated uncertainty.